This has been a very busy week. I have participated in the toughest negotiations... actually, they were tough mostly because the parties were not very well prepared, or, more specifically, the documents were a mess. I hate participating in the negotiations when documents were translated by someone else (save for my proven partners), because as a rule there will be mistakes and inconsistencies. I make mistakes, too, but they are my mistakes... and there are not many, frankly. But in this case the legal agreement was one big mistake. We worked for 12 hours for several days and when everything was finished and the minutes were signed (at 10pm!) I was very happy. I even uncorked a bottle of champagne at home. 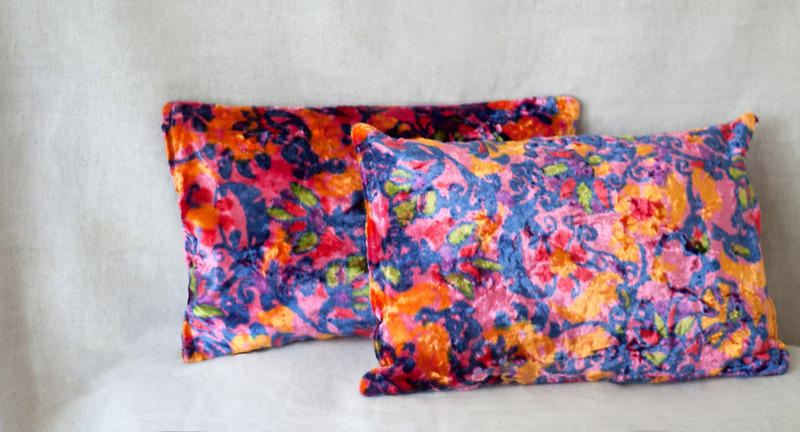 Speaking of nice things, my Uzbek ikat velour pillows from the previous post sold very quickly, and now I have another pair. They are even more beautiful, but oh so hard to photograph because of this silky glistening - even in the soft light. What can I do! Maybe it is not a bad thing when the item is better than in the photograph - better than the other way round, that is for sure! It is a pity that a photograph cannot convey their silkiness and softness. This vintage silk velour is amazing to the touch; I do need to have a pair of such pillows for myself, only I need green or gray ones, to go with my new old Chinese rug. Sorry to hear about your tough negotiations this week. Glad it's all over now.